What Is The Best Bluetooth Audio Adapter in 2019? →What Is The Best Bluetooth Audio Adapter in 2019? Does your phone provide a constant distraction while driving? Are you unable to keep your eyes on the road because you keep glancing down at notifications and changing songs? Are you forced to drive one-handed even though you know you need two because you keep having to answer important phone calls? If these problems are starting to affect you, then you need to look into getting yourself a Bluetooth audio adapter for your car. Not just for your safety, but for the safety of everyone else on the road, as well. 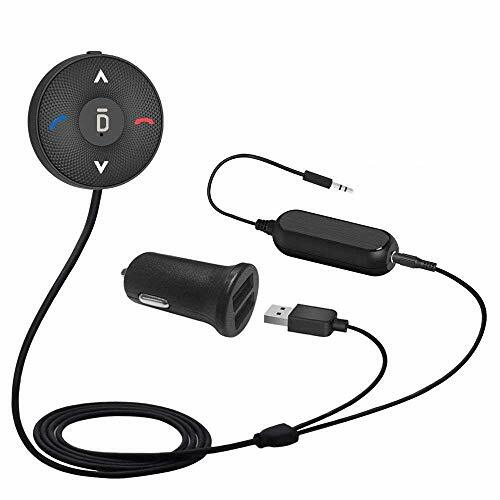 Bluetooth audio adapters are a great way to make your driving safer while still staying as connected as you possibly can be. With one of these gadgets, you can play music, change the song, answer calls, and sometimes even use voice assistants like SIRI. A Bluetooth audio adapter can open up your eyes to a whole new world of safer, more connected driving. You will thank yourself for buying one, and others will thank you for making the roads a safer place. Having trouble deciding with Bluetooth audio adapter works best for your needs? Check out this handy guide that will fill you in on the best Bluetooth audio adapters for your needs. 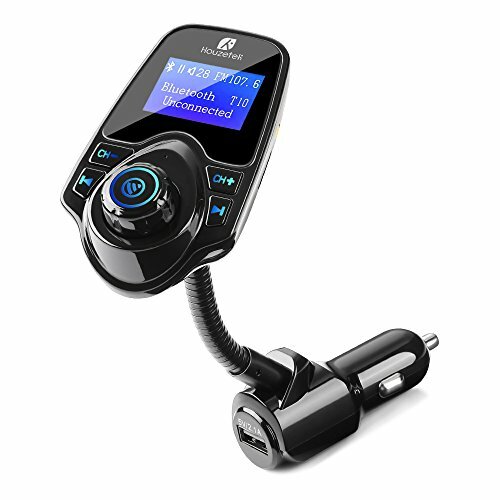 The Houzetek Bluetooth FM Transmitter is one of the best overall Bluetooth audio adapters for your car that you will find on the market. For a price lower than many less technologically advanced models, you get all the high quality features you are looking for. You can play music through the Bluetooth connection, via aux cord, or by inserting a microSD card full of audio files. And no matter what method you use, your music will sound great because this adapter removes background noise to clear up the sound quality. The Houzetek also comes with a 1.4” backlit LED screen that will show you incoming calls as well as the songs you are playing via Bluetooth. You can use the buttons on the adapter to change tracks or answer calls, all without having to take your eyes off the road to look at your phone for long periods of time. The adapter also features a USB charging port, so you can keep your phone battery strong and bump some serious jams no matter how long your ride is. The Veneibe Bluetooth 4.1 Car Receiver is a great inexpensive option for those who want a solid Bluetooth adapter but are still very budget conscious. This affordable adapter works with almost all Bluetooth compatible devices, no matter the brand. It reduces background noise so that your music comes out in crystal clear quality. Plus, this adapters three button operating system is a breeze for anyone to use. And it can connect to some voice assistants like SIRI and Andrews so you can use your phone to its fullest extent without ever taking your hands off the steering wheel. 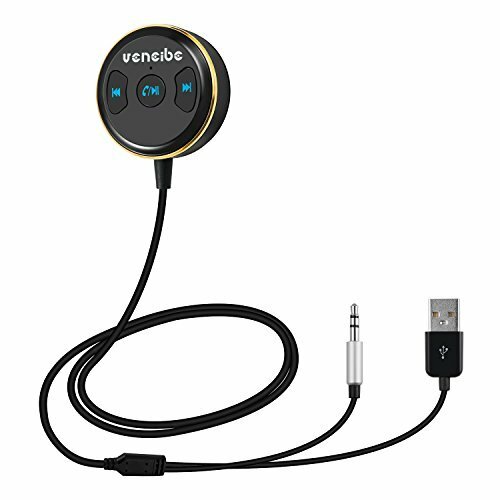 The Veneibe does require an adapter that has a USB port and a car audio system that has a compatible aux cord, but if your vehicle has the necessary requirements then this is a great affordable option. The Besign Bluetooth 4.1 Car Kit is an efficient option for those who wants all the ease and utility of hands free calling. This adapter uses less power than its competitors, but that efficiency does not take away from its usefulness at all. It can connect to two Bluetooth devices at once, so you and one of your buddies can both play music from your phone and answer your calls without using your hands. It also has the ability to work with voice assistants like SIRI, so you never have to take your hands off of ten and two. The Besign does have some issues with background noise and static creeping its way into your sound quality, but it comes with a noise isolator you can attach and use to dull that annoying buzzing. This adapter also needs to be used in a car that has an aux port in their audio system, but as long as you have the right hookups this is a versatile and efficient Bluetooth adapter that will give you all the hands free capabilities you want. 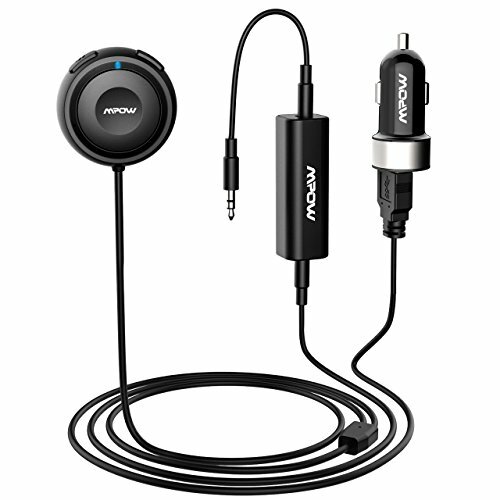 The Mpow Bluetooth Receiver Car Adapter is a great option for those who are somewhat technologically challenged. Some Bluetooth adapters come chocked full of features and options that you know you will never use, and that just provides more confusion when it is just not necessary. The Mpow’s easy to use three button operating system is so simple anyone can figure out how to change songs or answer calls. The Mpow also comes with an extra USB charging port and an optional noise isolator to dull the background noise the adapter sometimes causes. 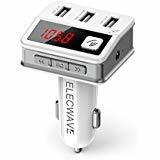 This adapter requires a car with an aux port in order to be utilized, but if you have the right car this adapter is an excellent choice who want hands free ease without a bunch of confusing, high tech extras. The Sumind Wireless Bluetooth Adapter is an easy to understand choice that still offers lots of exciting features. It has a big, 1.7” LED screen and extra-large buttons, so you can easily read it even at a distance. Now you do not have to strain your eyes and focus on something besides the road, because you will be able to easily read and use the Sumind. It also is able to prevent most background noise, has two USB charging ports, and is able to easily maintain hands free calling. If you have limited real estate available in your car, you may not want to consider the Sumind because it is the biggest and bulkiest option on this list. It also has some durability issues due to its size and does not always connect easily. But if you are looking for a base adapter that you can count on being able to read no matter how distracting the road is, the Sumind is a great option. 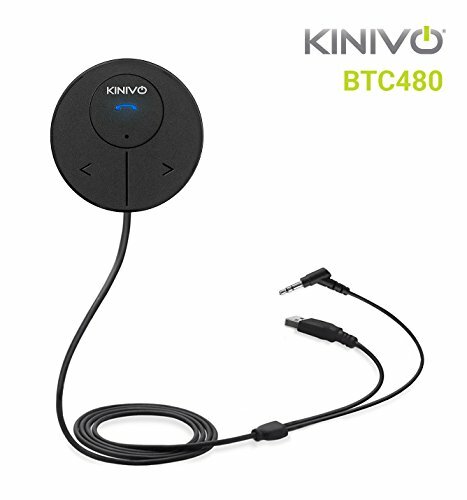 The Kinivo BTC480 Bluetooth adapter is an excellent model for those who are not concerned with price, but instead just want to get the best option money can buy. If you are one of these free spenders, the Kinivo will entice you with its hands-free calling capabilities, clear sound quality, extra USB adapter, and ability to connect to multiple Bluetooth devices. The Kinivo is not prohibitively expensive, but the difference between it and some of these other Bluetooth adapters is quite significant. It also requires a car with an aux port to play. If you do not mind shelling out a few more bucks, the Kinivo is a great choice for a Bluetooth audio adapter. 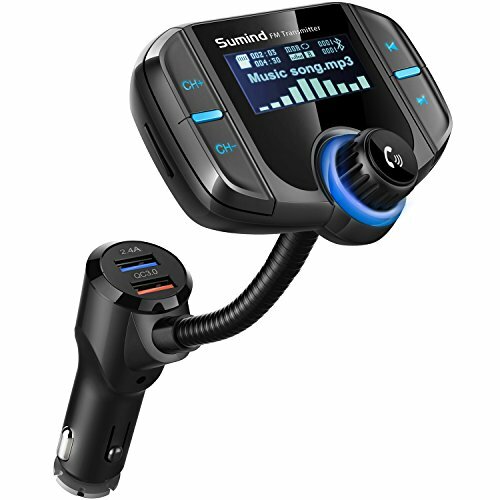 The Sumind FM Radio Bluetooth Adapter is another very easy to use option. Its one-button operating system is so simple that anyone can use it to answer calls and play music hands free. This adapter also comes with two USB charging ports and a magnetic car mount for your phone or other Bluetooth device. The Sumind does have worse sound quality compared to many other Bluetooth audio adapters, and it sometimes has trouble connecting to new devices. 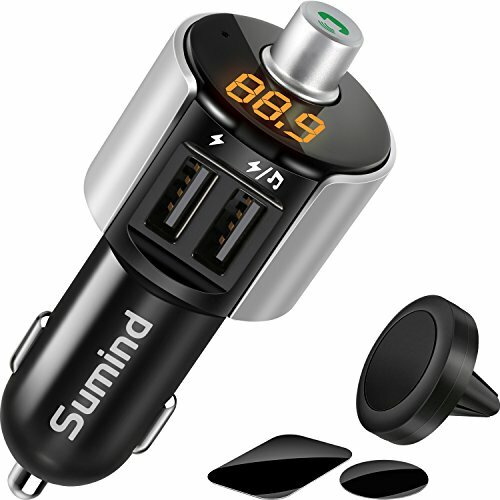 However, if you are looking for a Bluetooth audio adapter that is easy to use and gets the job done, the Sumind could be the right adapter for you. The Elecwave EB02 Wireless Bluetooth audio adapter is a great option for those who like to be able to mess with settings to get things just how they like them. This adapter comes with adjustable EQ settings, so depending on the type of music you are playing, you can adjust the EQ to get optimum sound quality no matter what. This adapter also has a big, red LED display and three USB ports, so you can charge your phone, tablet, and mp3 player at once. The Elecwave does lose some of its great sound quality when you crank the volume up. Also, the various settings on the adapter can be quite confusing to figure out. But if you are dedicated to the best quality of sound (or need to charge three things at once), then the Elecwave is a great option for you. Bluetooth audio adapters offer a lot of great benefits and exciting features, but it can be overwhelming sifting through all the information to find out what matter. These are the things you need to look out for when deciding which Bluetooth audio adapter works the best for you and your vehicle. It is important for your Bluetooth audio adapter to be compatible with your car because otherwise it would be literally completely useless for you. For example, many of the adapters require an aux port to connect to the car’s audio system. Without one, it would not be able to play music. Many older cars do not have an aux port anywhere in their audio system, so buying am adapter that needs one would be basically pointless. It is also important to make sure that the adapter is compatible with your music playing device, but seeing as how just about everything that plays music these days is also Bluetooth enabled, that should not be a big issue. If you are going to use a Bluetooth audio adapter to play music in your car, it is important to make sure that it sounds good. Most Bluetooth adapters have to deal with background noise and static caused by the connection, but some have the technology to mute or at least turn down that annoying buzz. No Bluetooth audio adapter is going to magically make your tunes sound ten times better on your same speakers, but it is important to get an adapter that does not make it actively worse. You have to know how to use an adapter if you want to get anything out of it. Some have large LED displays and multiple buttons and options. That might be perfect for you if you are particular about your settings, but if you are a bit of a Luddite than all that extra hoopla will just give you a headache. Accommodate for your own lack of technological understanding, and do not throw yourself in the deep end when you are not ready for it yet. There are plenty of easy to use Bluetooth audio adapters out there. The best Bluetooth audio adapter is a question with no easy answer. Some offer excellent hands free call capabilities, while others are primarily focused on the best quality sound. Some need all kinds of adapters to work, while others can plug right in and work immediately. Some have big, easy to read LED screens, while others take up as little space as possible with just a few small buttons. Whatever kind of Bluetooth audio adapter you are looking for, the right one can make your driving easier and significantly safer. So consult this helpful guide and figure out exactly which Bluetooth audio adapter will be the most helpful in your life. What Is The Best Android Auto Head Unit in 2019? What Are The Laws on Radar Detectors in the USA? How Do You Use An OBD2 Bluetooth Scanner?